The Fred Lebow Half marathon will always be special to me. The 2018 edition was my first race as a Dashing Whippet. I remember lining up with Karlo, Bobby, Jeff, Kathleen, and beginning my Whippet journey. Fast forward one year, and I am astonished over how much I have accomplished. I was excited to see what I could do on the same course one year later. In the days leading up to the race, I constantly checked the weather. Climbing Harlem hill twice and cat hill three times is hard enough to mentally prepare for — but factor in wind and rain, this would come down to grit. I exchanged messages with Garrett, debating if NYRR would cancel the event. 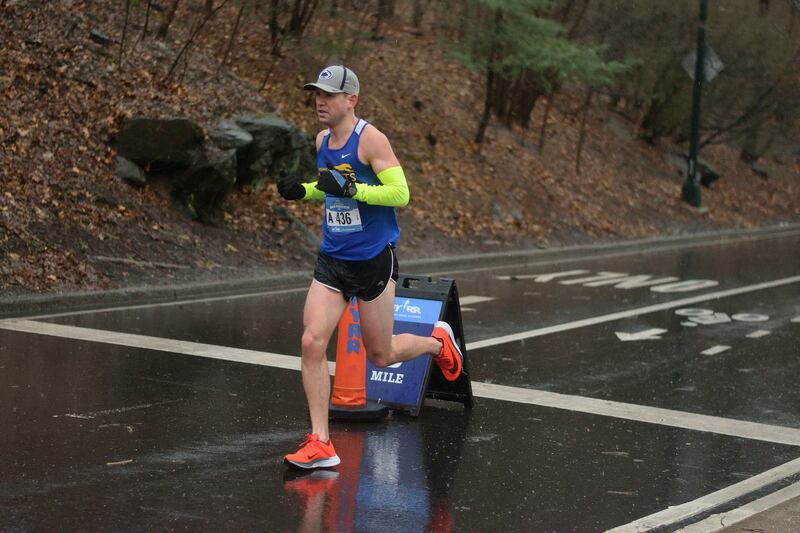 I did not run the 2018 Boston marathon, and do not want to compare it to that day, but this was one of the worst weather conditions I have raced in recent memory. In an odd way, I was looking forward to it. It is only the beginning of the spring training cycle, and I knew a PR wasn’t possible due to my fitness. But testing my mental strength was important to me. After waking up early, I grudgingly ate my peanut butter and banana pre race breakfast. I left my apartment and started my warm up at 7:20. It was only drizzling, and the wind was relatively calm. This settled my nerves. I arrived at the start line at 7:45 for an 8 AM start. Luckily enough, Karlo and Ellyn agreed to hold my backpack and spare clothes. I didn’t have to budget extra time for bag check. I saw a slew of other runners shivering. I thought to myself how lucky I was to have teammates who are helping me out. I wanted to run well for them. I saw Garret right as the corrals were closing, and wished him luck and gave him a fist pump. He had surgical gloves over his running gloves to keep his hands dry. Something to keep in mind next time. As NYRR collapsed the corrals, I moved my way towards the start line, standing a few rows back as the gun went off. Immediately, a NYAC runner took off at 5 minute per mile pace. That man was in his own world and ran an unbelievable race. I found myself packed with two runners, Jerry from NYAC and John from NBR. We introduced ourselves, chatted and said our goal times. We agreed to work together. As we were all aiming for approximately the same 10k split. Mile one was relatively relaxed and on pace. Right before the 72nd transverse I saw Young, Steve, Steph, Mike, and others cheering. I was excited to see them out there. I did try to recruit people to cheer the week leading up to the race. And was grateful they were out there. Mile two which included cat hill was a bit slow. And I sped up for mile three to keep myself honest. Unfortunately, neither Jerry nor John followed me. This would be a solo half marathon on a cold, windy, hilly course. Before the 102 transverse, I spotted a former high school teammate and current QDR runner, Ali, cheering. The New York running scene is amazing. That gave me a boost before I would tackle Harlem hill. Ascending that hill the first time was effort based. My tangents were still good. My watch was aligned with the mile markers NYRR put out. I knew this wouldn’t last for the remainder of the race. Now onto the rolling west side hills. I completed My first five mile loop in about 28:30. I spotted Karlo and Ellyn on the west side. I could tell they were pumped to see me in 2nd! Jerry and Matt gained some ground on the west side hills, and I thought, “this may be a battle for 2nd and 3rd after all!” At this point I knew were the cheer sections were. And looked forward to seeing my teammates and friends out there and used them as checkpoints throughout the race. The Whippets squad at 72nd was larger and louder this time! I didn’t get too amped as I had to sharp left turns coming up. And I didn’t want to slip and fall on my face. I looked back and saw John fading and didn’t see Jerry at all. 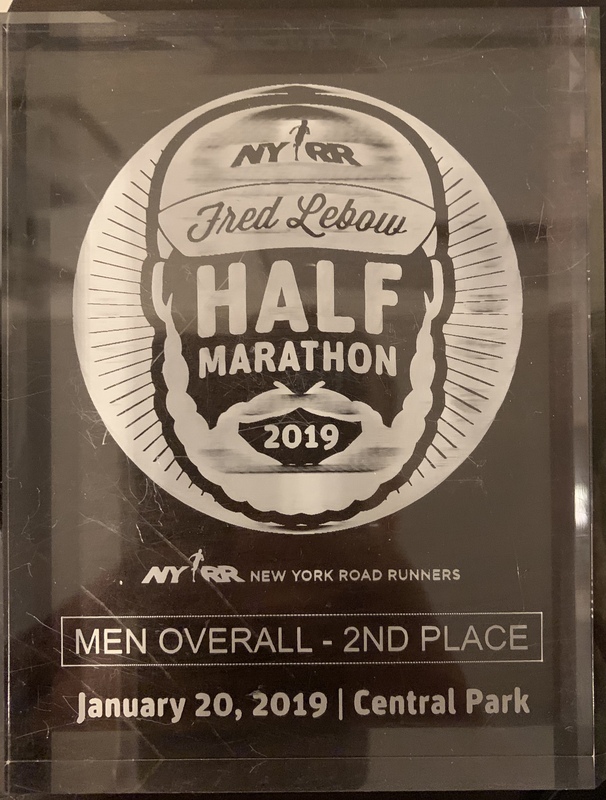 If I held it together, I would get second in an NYRR event! Cat hill the hurt the second time. I started picking off lapped runners and knew my tangents would be out the window soon. That is when the wind started picking up on the east drive. I had planned on taking off my sleeves at about the 7 mile point. But I was getting cold, and decided to keep them on. I spotted Karlo and Ellyn again! I Was able to grab some water from them without having to battle through the water stations. I was not looking forward to Harlem hill the second time. I was pushed to the outer most right side of the course due to a lapped event. I put my head down and ran. It wasn’t pretty, but I survived the big hill and started cruising down. Another high school teammate of mine, Dylan, was running the race too. He shouted at me, all I could manage was a wave in acknowledgement. The rain had picked up. I saw steam coming off the runners from their breath and body heat. It made for a very surreal experience, running in a fog with everyone panting and hurting. I had no idea where any runners were behind me. I realized I haven’t checked my splits for a while. The effort felt about right, but I had no idea if anyone was gaining or losing ground behind me. There was a lot of footsteps, but that was from lapped runners. That’s when I realized the headwind I faced on the east drive was a cross wind on the west. Just make it to the Whippets at 72nd I thought. They are out there in the rain and probably colder than I was. 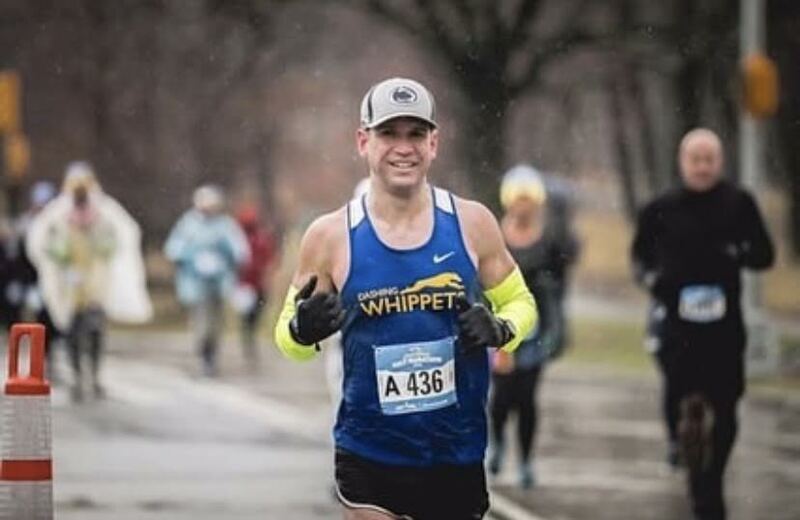 The whippets moved from the left side of the course to the right — a move I was grateful for. I was able to give them all a high five. That gave me more energy than I expected. At this point I still hoped a sub 1:15 was possible. And I knew I had to pick it up. There was just a sea of runners on the east side. My pace quickened as I passed lapped runners. Volunteers were trying to keep me inside the cones. But there was just no space. I was cold, wet and tired. I just wanted it to be over. Around engineers gate I saw Karlo and Ellyn one last time. I’m not sure exactly what Karlo shouted. But it worked. My last mile was my fastest mile of the race! A 5:23. When I crossed the finish line, 1:15:00 flashed. I wasn’t sure if I broke 75 it or not. All I wanted was a heat sheet. Volunteers ushered me to a covered area to get out of the rain. John from NBR finished in 3rd and Garrett finished in 4th! I was so happy to see him there. He’s a grinder and performs well in adverse conditions. I was given like 3 heat sheets as I tracked through the mud. I got my bag a few minutes later and changed into a dry shirt and jacket. Luckily the awards ceremony was soon after I finished. It was awesome meeting Jim Heim, even though I would have loved to meet Peter Ciaccia! I ran this race last year in 1:24:23 and this year I ran a 1:14:59. I am grateful I found this team. Thank you to everyone who was out there and to those who reached out over text, strava, IG and FB. The support is overwhelming. I really love this family!